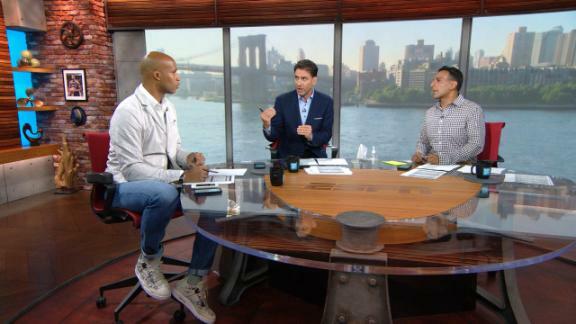 Richard Jefferson and Mike Greenberg react to the NFL's latest attempt to address the issues surrounding the anthem. President Donald Trump is once again inserting himself into the culture war over protests by NFL athletes during the national anthem. Trump tweeted Friday that he "can't believe" the debate has reignited after the Associated Press reported on the Miami Dolphins formally telling players they could be punished for protesting on the field. The NFL and NFL Players Association said in a joint statement Thursday night that they were halting enforcement of all anthem rules while they work out a solution. Trump took to Twitter to critique the policy, call for action from NFL commissioner Roger Goodell and suggest his own penalties. The NFL National Anthem Debate is alive and well again - can't believe it! Isn't it in contract that players must stand at attention, hand on heart? The $40,000,000 Commissioner must now make a stand. First time kneeling, out for game. Second time kneeling, out for season/no pay! No requirement for players to "stand at attention, hand on heart" exists, but NFL owners voted in May to require players who wish to protest to remain in the locker room during "The Star-Spangled Banner." Eric Winston, the president of the NFL Players Association, responded to Trump on Twitter by saying, "Thanks for your thoughts, but we'll take it from here."